Yeah, see for yourself, I don't think the theatrics were overdone. Yoshiki had a 1 minute speech, really, seriously, nothing longer, and he hit the gong at the end and shouted we are x a few times and went to the crowd as he usually does. That wa sit. 5 minutes maximum. I've been following these guys for over 20 years now and thought their MSG show was pretty damn awesome all things considered so I have hope they keep going for the right reasons. Let's see what the next one looks like. Just watched the Coachella video and the theatrical part was OK. Kiss the Sky could be scrapped from the setlist, it was weird to see them expecting the crowd to sing the "wowow" part while the song isn't even finished yet, and not even all the fans know it. And I hope Coachella staff can make it better on the next concert. The concert sounded awful due to the technical issues. I.V. started without the P.A., Wes and Sugizo lost too much time trying to fix their sound issues and looked like everyone had issues with their earpieces. So... the good news to me was that Toshi's voice did improve dramatically (almost odd) after Jade and while he did struggle in some parts, he did pretty well all things considered. It is a decent show. I really liked it. I enjoyed it. This said, I listened a second time the whole live without watching it on purpose to concentrate on sound. Toshi always needs to warm up, it's kind of self confidence problem. Apart from earpieces and guitars, and Sugizo's singing in I.V. - what was wrong with his microphone? - the global gig's issue was interaction between the band and the context. The weelchair was obviously out of place, mostly with people who doesn't know X Japan's aesthetics. They should have conceived this live for that kind of audience, without choirs and with more coordination between themselves, but with those technical problems I think it was almost impossible, you lose it. You know, I really think that they could solve 50% of their issues should they manage to start with a good performance of Jade, because is a marvellous song that could give them confidence and boost. All things considered, they did more than I would expect in that condition. Toshi did his best and I think somehow the public felt it. BTBF helped to find some connection. Let's see the next one. BTW, lakeisle did you say they won't broadcast it? Toshi always needs to warm up, it's kind of self confidence problem. I don't think so, Yoshiki said Toshi couldn't hear anything from his monitor, so it was like he was singing acapella the entire time. I think he did really good given all the circumstances. Yes, some of them looked very interested and involved. I always wonder which obstacle makes it difficult for western people to listen to j-rock... Is it a different way of feeling, or of singing, or both, or the unusual mixture of styles? Or the fact that we instinctively associate any japanese musical performance with pop manga soundtracks and not with rock? I think he did really good given all the circumstances. Given all the problems it was a really good concert imo. Toshi was marvelous until X, where he lost his voice. The guitars were definitely messed up.. the timing issue on the double guitar solo during Endless Rain was definitely not lost by the band. Sugizo's face expression during his violin solo for Kurenai said it all...the violin tuning or SOMETHING was messed up. Then hide's hologram wasn't working even when Taiji's was... And the overall quality of the hologram just wasn't good. IV backtrack also started before Yoshiki got back to his drum. I know that sounds like a lot of problems.. tbf, the night had a handful of them. But I have to say, even with all that it was a great concert! Everyone was in good shape to me. Yoshiki's new technique sounds great, Toshi's voice was beautiful and full of trill and clarity (his pronunication during Kiss the Sky was the best yet). Speaking of Kiss the Sky, I actually thought it was a great addition to the setlist. It was beautiful and the "woah woah woah's" actually worked better than I thought they would.. it was hard to watch at first but X stuck with it and won them over! Toshi even said "thank you" afterwards. It was a good monent. It made me happy as a fan. BTBF was a hilight for me. Good for the audience. I personally think they need to bring the English version of Kurenai back... Maybe tweaked a bit but it would connect them to the audience so much more. I actually feel bad bc when they reunited I hated the idea of X rewriting their songs in English... Haaated it. But now... I'm finally seeing it the way I think Yoshiki was and have come around to it. I even think it's necessary. Plus it would be cool to get a different perspective lyrically instead of just hearing the same older songs the same way over and over. I still think rewriting the old songs in english is a terrible idea. So did they, who got back to japanese. It feels more "authentic". Let the new songs be in english and the classic songs be classic. They are trying to get new fans overseas, but Yoshiki himself said that they can't lose their japanese roots. And the concert overall was good. The band itself was in a good shape, even looking nervous. The main issue was on Coachella structure, there were too many technical problems, not only in the audio, and even the hologram failed. I really hope the second concert is better. Wow, so much I want to say and I don't know I can even get it all into one post. My feelings on the concert are that it was a great success in many ways. It finally brought them to the American public, even though the audience wasn't the best type to try to get out there and be known, with. I am not a Beyonce fan but I will say this. X Japan is real music. Beyonce is a bunch of women dancing around the stage in the same way that they and others have for the past 20 or so years and it's old, to me. I am not interested in watching that sort of crap at all. I AM, interested in all of the members of X and their well being. I love them, all. I think other than the people who were there to see X from the get-go, the rest of the crowd never saw visual kei before and were probably confused by what they did see in the video going behind the band and the holograms. They may have been confused by the holograms and not even realized that hide and Taiji were no longer alive and that's why there were holograms going on either side of the band, if only for a moment. I am pretty confident they also had no idea how much hide and Taiji wanted X to perform in the US and what that meant to them. So this whole thing may have been confusing to them. They'll get over it if they were confused. Hopefully, they'll remember it and want more! However, the band did a teriffic job, despite all the equipment malfunctions and what appears to be Toshi's stage fright on Jade. And I think that's basically what it was for him - stage fright. IMHO, of course. But as soon as he got past Jade, knew he could do it, he opened up and let loose with some fantastic singing all the way up until X where his voice started cracking, again. I felt awful for him at that point. I think if Jade had gone bad for him and his voice cracked during the opening song, that would have been a disaster for the rest of the concert. Once he got through it and did such a marvelous job, his confidence came back. I don't think the theatricals were overdone, either. I do think, maybe, Yoshiki should have cut the "We Are" part shorter when he realized his voice was gone or he'd lost it. Those people in the audience probably had no clue what that was about but then that's the kind of audience they were playing to. To me, those were just a bunch of kids out to party, get drunk, do drugs, etc, etc, etc. I am in total agreement about the wheelchair footage. That was just unnessicary and the crowd, for the most part, wouldn't even understand what that was about. A few people, helenmoon, included, have asked about why Americans may not be interested in J-Rock, etc. I think the answer is simply that they don't know the Japanese language at all, don't understand what they are hearing or the meaning of it nor the pronunciation of the words being sung. I really think that may be the only barrier. They need more exposure and to jump right in there and find out what the lyrics are, translate them if they want to and try to sing along. Just enjoy it because the music is so excellent. I have several aquaintences who can't speak or understand a word of Japanese but once I exposed them to X, they really are getting into them, or at least two of them are. One guy was already a fan of Baby Metal so I'm not sure if he just wasn't paying attention to other J-rock bands in general or what. He likes another young girl band from Japan, though. Maybe he wants to watch females instead of males? IDK. The other main guy works in the music industry, apparently. He may work at a record shop of a sort. Not sure as he's never said but he keeps close track of charts such as Billboard and others and can pull up stats in a heartbeat. I know he was excited about watching them at Coachella and had told me after I was posting videos all the time, that he was going to buy Blue Blood as soon as he got the chance and that was a few months ago. He said he had never heard of them before I started posting their videos on a certain forum we both belong to and that he really liked them. He also said he wished they also would sing in English more often. If he would LISTEN, he might realize a lot more of what he hears Toshi sing, is actually in English, not Japanese. The 3rd guy heard Scars and that was the first time he had ever heard X. He said he really liked it. And that's saying something for an older Stones fan! So they have a chance. They just need more promotion and exposure, I think. As far as me recording. I am more than happy to have done it for the fans, here. And of course, I have my own copy as well. I am just happy that I could make my fellow X fans happy. That's all for now but I am sure more will come up later on. 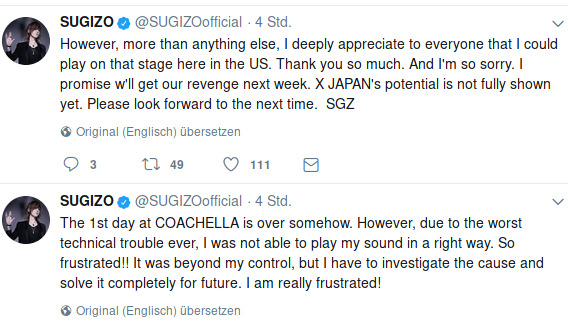 Sugizo posted on his Twitter earlier in japanese about the technical issues, he now posted the same messages in English. The 1st day at COACHELLA is over somehow. However, due to the worst technical trouble ever, I was not able to play my sound in a right way. So frustrated!! It was beyond my control, but I have to investigate the cause and solve it completely for future. I am really frustrated! **Note: I'll give my thoughts on the show a little on. I kinda need a bit to process it. I totally disagree here. Or maybe not totally, but I liked X not only for their music (instrumental) but also for the reason that it's not one of this 54984651378 english (symphonic) Metalbands. ... . Why I'm not totally disagree in this case is the reason that Kurenei had an english version back in the 80s. But besides that ... Rusty Nail sounds awful (to my ears) in english. But I also have to say this about the Loudness album "Disillusion". There is an entire english version of the record. I don't think that the translation in another language is possible everytime. There is a german song called "99 Luftballons" from Nena. "99 Redballoons" also didn't work at all... But it's just my opinion. I just want to put it out there, that Yoshiki said, Toshi couldn't hear himself the entire Time, and he was singing like that. No wonder he touched his earpiece all the time. And no wonder Jade was weaker than the other songs. Singing like yoi can't hear yourself, is a huge challenge so seriously kudos for him. And Sugizo too. You know I also play in a band, and when yoi can't hear yourself that is a huuuge problem. It makes the songs fall apart. So regarding these circumstances, they held it together very well. Good job! And good luck for the revenge! Anyone knows if it's gonna be broadcasted somewhere? I still haven't watched it and I can't wait to get home from work to do so! Thank you so much guys for recording and uploading! TL;DR: ate some (really) bad lasagna, landed in the hospital, then passed out. Kids, don't eat bad lasagna. It can kill you. Or worse, keep you from watching X live at Coachella. Judging only from I've read on the internet so far, this seems to be a typical case of terrible planning at a management/creative level. Echoing pretty much what you guys said before: it was not the right moment to evoke X's long and tragic history - and yet, can X exist and connect with an audience beyond that very history? Or have we all just realized that no, they actually can't pass for a palatable and easy to explain festival act? 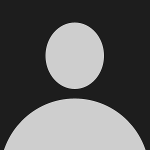 How do you zip-file their existence since 1982 and showcase it in under an hour? Maybe you can't and playing at Coachella really was a huge mistake. This is an extremely interesting question. I would go with a mix of language barrier (and the incorrect assumption that you absolutely need to understand the lyrics to feel a song), unusual looks and a generalized gender-fluidity phobia in the West (how many times have you introduced awesome Jrock bands to your friends only to have them debate if that guy in the frilly outfit is male or female?) and most Jrock bands being rather reluctant about intracting with western audiences. X Japan is an exception here and I see Yoshiki's efforts to establish a connection with the West with great, great respect. You can question his methods, but you can't deny that it takes some serious balls to do what he's trying to do and brush off the backslash. Then look at his fellow bandmembers: few have a presence on mainstream Western social media (Pata, Heath) and those who do (Toshi, Sugizo) hardly even bother to translate their posts for the international fanbase. Of all, Yoshiki is also the only one who bothers to fly here and there to meet fans in Europe and America - correct me if I'm wrong, but I don't think he ever brought a fellow bandmate along to his We Are X "premieres", conventions and whatnot. Again, language barrier is a thing, but Toshi and Sugizo sound decent enough in English to do the job. So why don't they? Maybe because being a superstar in Japan is already a full-time job! In terms of music, X is always a good example of a band that's very palatable for Western audiences. The base of their sound is very classical and the structure of their ballads evokes well-known acts like the Guns, the Scorpions, Led Zep, Metallica, etc. If you like classic rock, you like X. But you need a very open mind. Then there's a few bands that are very typically Jrock but that somehow have a je ne sais quoi that just works in the West. Dir en Grey, for example. Not my favourite band ever, but I felt a connection with their music from the start. Tracks like Ain't afraid to die are, by all standards, amazing pieces of music that break the language bareer quite easily and that I never bothered to Google Translate. Their looks are still pretty shocking and can elicit a very loud WTF?! if you don't know them, but they soon become captivating. Malice Mizer is another example. If you like metal, you like these guys. But again, you need to broaden your horizons. Then you've got other bands that are just as awesome, but that don't work in the West and never will. Say Buck-Tick. (Not they they ever tried to leave their comfort zone, anyway.) For once, the looks and stage acts are quite tame, but their lyrics are cryptic, their feel is somehow a dozen shades darker than Bauhaus. To enjoy Buck-Tick, you can't just be a new wave fan. You really need to be living deep in a bat-infested cave! Bottom line is, of all Jap bands, X is still the one with the biggest potential to succeed overseas. They have the sound quality, the experience, the connections and one hell of a story to tell. But they need to make serious efforts to pass for world citizens and break the "typical cray Jap" stereotype. Coachella is not the right place to start. Just mirroring some things others have said, the theatrics related to things that people there would've had no idea about were unnecessary and would've been a turn off, it's just as much of a problem as when they did it at the Lolapalooza show, no one's going to get it, and if you want new people to see a show where some of this info can be presented in a way that they can take it all in/understand the history, do it at shows that will either be broadcasted worldwide or get released in some form, big shows like MGS, Wembley, or the Olympics if they end up performing there. This is also a case of just trying to load new peoples minds with too much info at once instead of playing the songs and letting people concentrate on the music. However, it being X they of course didn't fail on bringing top moments where they get their most crazy with Toshi shouting "we are, we are", then Toshi playing on the drums while Yoshiki's shouting, and yo's final drumrolls with Toshi shouting and all that, while it's definitely very confusing to that kind of crowd who's never heard them before, it's no doubt exciting, infact not knowing what's going on in the moment could make it more exciting in a way. Big question imo is, does all that at the end make those people forget about Sugizo's terrible sound during the solos and toshi's constant cracking during 'X' that came before the "we are, we are" crazy stuff? I think Toshi carried the show before 'X' when a lot of their things were going to sh**, despite apparently not being able to hear himself through the whole thing, he was singing extremely well (I thought his vibrato sounded different than usual though, maybe not hearing himself explains it), barely a crack from his voice before 'X', and even though some of the crowd participation in songs like Kiss the Sky was too much for that crowd (only the third song in? Really guys? ), I think Toshi led those people well into understanding what to do, from what I could hear it sounded like a lot more then the three rows of X-Japan fans at the front who were singing the "woah woah woahs", at least it sounded like they were trying to remember what toshi sang and give it a go. It's hard to tell which side the people there leaned towards, either 'confusion/terrible guitar sound' or 'some excitingly paced songs with a great singer (except the end gulp) who's good at entertaining them and getting them interacting'. It's like a confusing mix of both which could make people think "I didn't like a lot of the things they did, but they're very entertaining and wierdly interesting and I'll probably ckeck them out next weekend, hope that singer doesn't crack as much". But there will also undoubtably be people there who are only into the rap, rnb, dubstep, chill thing and couldn't give two flying f**** about guitars and structured songs like that, or anything before the 2000's, and don't want to hear anything emotional either, that was a given from the off though. Overall it all probably turned out okay reception wise, and X-Japan will be there next week and hopefully show them more of what they're like performance wise. Yoshiki keeping his speech to one minute and saying some basic things was probably the most wisely restricted and 'presenting themselves as a new band to new people' thing they did the whole show. As for nowadays, I still don't think it's impossible, but extremely unlikely now unless they get moving, have this album out within a couple of years, or do a glorious show at the Olympics, infact album in the West + Olympics would do the trick, but depends on how Yoshiki's physical/mental health improve from here, it's still possible they can do it. I reckon they definitely could've made it ten years ago quite easily, and sticking with the old album plan of lots of the old songs redone with english lyrics mixed with new songs would've gone down a storm (I think Scars for example would be a well loved song, and it has a modern Muse era type rock feeling to it). the old songs weren't popular because of the language, they're unique compared to any other band I've heard, even the songs most comparable to other metal bands, I understand Yoshiki not wanting to be stuck in the past and have "look at us Westerners look how popular we were with this style in the 90's" as their selling point, but at the same time, their songs are timeless in a way and Yoshiki would never have needed to advertise at all that "half the songs in this album are old ones btw", just release them plus some new songs under the banner of a new album, first introduction to the band in the west and it would've turned out great imo. GOOD POINT! I watched part of it during lunch break and damn, kudos for Toshi! His singing was very decent for a guy who's tapping his ear monitor every 3 seconds. And without Yoshiki stumbling around stirring the drama, you can tell what an awesome stage presence he has. Kudos for Toshi, for the impressive damage control! I also found that the guitars didn't sound half as bad as I feared they would. And kudos for Sugizo, too. He was certainly aware of the sound issues but kept his cool like a pro. I just relistened to Jade and I think this is one of Toshi's better versions of it, I'm not sure what people mean here when they say it wasn't great and he picked up after that. Btw, I hate when they essentially stop the song after Toshi finishes singing the bridge, I've always way preferrered the first two years they performed it, where Toshi's singing in the bridge was an epic build up to the last chorus repeating again. It's always been crap since then when they decided to stop the song after that to get the crowd to sing it back to them when imo the chorus doesn't fit that kind of crowd interaction, and then they go back to the chorus, it weakens that moment when it used to blast into the last chorus, it used to feel powerful. I though performing to a whole crowd who's never heard them before, they'd stop doing that for this one show and go back to the old way they did that section, but nope, they really confuse me sometimes lol. Y does noone mentions Kurenai? You know what, I have seen a lot of comments from non-fans that saw them live and on the stream and they have all been saying how awesome X Japan was LOL I have a friend that saw the stream and she thought they were incredible and she loved it, I mention the things that went wrong and she said she didn't notice anything too bad. I guess *we* know it wasn't supposed to be like this because we are very familiar with the band but maybe someone else might not pay so much attention to details or even notice what was wrong. I think, all and all, the reception was positive. EDIT: When Kurenai started, the deeper sound really threw me off because it was so unexpected, I heard the version from the Zepp Tokyo concert and it didn't sound so different to me as this one, might be related to all the problems they had who knows. I think the performance was going pretty well until the 2nd solo. oh well. When I and others here have mentioned Sugizo's guitar sound problems I think we're mainly refering to the kurenai gutar solo, at least I am, are we missing something else? the only other thing to mention I guess is Toshi's voice, but it was just the same/as good as on the other songs. Not only the guitar solo problem bit the violin sounded screechy. I guess it was in a lower key too? I didn't even notice, but maybe that explains why I wasn't as interested in it at this concert. Kurenai was my least favorite song performed this time. Kurenai has his violin start back and TOSHIS VOICE! Did I mentioned that I luv the violin beginning? I do love the addition of Sugizo's violin to Kurenai, just not this time I actually love allllll of Sugizo's violin input... It's literally always only added to and made a song better. It kind of makes me sad Sugizo and Yoshiki never collaborated before!